Staff Selection Commission (SSC) is fully responsible to conduct a online written examination named Combined Higher Secondary Level (CHSL) Examination every year. A candidate who have passed the Intermediate (10+2 Level or 12th) exam from a recognized Board is eligible to take part in this exam. From This year SSC has changed the exam pattern of Pre Exam. This year SSC will be conducted an Online Exam for Tier-I. Through this exam SSC recruits the candidates for LDC & DEO in various Govt. Ministries & Subordinate offices and this year Postal/Sorting Assistants and Court Clerks also. SSC CHSL 2017 Tier-I Online Test will be conducted in the month of March, 2018. The Commission will consist of a computer-based Exam (Tier-I), Descriptive Paper (Tier-II) and typing Test/ Skill Test (Tier-III). The SSC 10+2 Tier-II Paper will be a descriptive paper of 100 marks in Pen and Paper Mode. The duration of the paper would be for one hour. This paper has been introduced to assess the writing skills of the candidates which are necessary in govt jobs. SSC LDC DEO (10+2) Tier-III of the exam would be the Skill Test/ Typing Test which would be of qualifying nature. The final merit of the successful candidates would be determined on the basis of total score obtained by them in Tier-I and Tier-II. The Commission will be held the Combined Higher Secondary Level (10+2) Examination Tier-I from 4th April to 26th April 2018 (Computer Based Examination). There are total 3259 vacancies for various posts. The tentative vacancies for the posts of LDC/ JSA, Postal Assistant/ Sorting Assistant and DEO are 898, 2359, 2 and Data Entry Operator Grade A- Nil, respectively. Aspirants who qualify for the Tier-I exam will be called for SSC CHSL Tier-II exam. Staff Selection Commission will also organize the SSC CHSL Tier-II Exam (Descriptive Paper) on 8th July 2018. Applicants can download SSC CHSL using name/ registration number and date of birth. Open the link and select CHSL Exam 2017 tab. After that, you select the desired SSC Region and open the proper link. 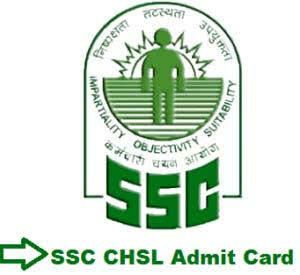 After that, your SSC CHSL Admit card 2018 will be displayed on the screen. Download it and take a print out of SSC CHSL Call Letter 2018.